Quarterback Easton Stick (12) looks to add to his passing touchdown record this weekend against Youngstown State. Death, taxes and the North Dakota State football team winning the Harvest Bowl: The three certainties in life. In the 43-game history of the Harvest Bowl, a game used to celebrate NDSU athletics and the excellence in agriculture, the Herd sport a 39-2 record to go along with two ties. The Saturday matchup that pits the undefeated Bison (8-0, 5-0 Missouri Valley) against the Youngstown State University Penguins (3-5, 2-3 Valley) gives NDSU a great chance to extend their Harvest Bowl dominance. Going back to last year, the Bison are riding an FCS-best 14-game winning streak. 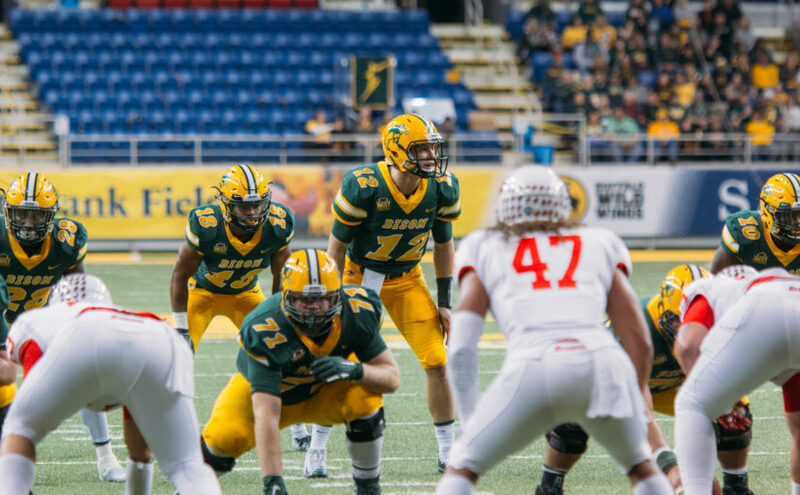 The 59-14 romp of the South Dakota Coyotes this past Saturday further showed that the Bison are head and shoulders above the rest of the FCS, as the December playoffs loom. For Youngstown State, the season cannot end fast enough. The Penguins have long been out of the Missouri Valley Conference race and are coming off a 43-17 loss at home to Indiana State. A big key for the Bison this weekend is to stay healthy throughout the course of the game. Of course, winning is always the number one priority in any game. However, keeping key players healthy for another run at a championship is absolutely vital. Running backs Bruce Anderson and Seth Wilson both are questionable for the game. NDSU also had a number of players on the turf at the DakotaDome last week. Cornerback Jalen Allison left the contest with a knee injury, but the injury was not as bad as initially feared. Another big key to Saturday’s matchup is that the Bison don’t beat themselves. Costly turnovers, dropped passes and penalties wiping out big plays may allow the Penguins to stick around in the second half. Bad things happen when a good team lets an inferior opponent stay in a game for too long. But recent history suggests that this is not likely. NDSU has only turned the ball over five times all year. On the flip side, the ferocious Bison defense has forced 18 turnovers. Combine the two factors, and the Bison have the fourth best turnover margin in the nation. On the offensive side of things, Easton Stick just became NDSU’s all-time leader in passing touchdowns. Considering Indiana State quarterback Ryan Boyle tore apart Youngstown State’s pass defense in tune to 325 yards and three scores last week, there’s no reason to think Stick can’t enjoy similar success and add on to his record. Stick’s ability to spread the ball around (nine different receivers caught passes last Saturday) and utilize all the weapons at his disposal make him a tough matchup for any defense, let alone one that has struggled against the pass all year. Even without Anderson, who led the Bison backfield before injury, NDSU weapons are plentiful. Lance Dunn leads the team with eight touchdowns this season. Joining the senior in the backfield is Ty Brooks, who is able to break a play at a moment’s notice. The tight ends are becoming more of threat, especially in the red zone. Ben Ellefson has a total of eight catches this season, but half of those have gone for six points. For the defense, it’s more of the same. Shut down the run and put pressure on Penguins quarterback Montgomery VanGorder. By shutting down the Youngstown running game, the Penguins will become one-dimensional. One-dimensional offenses have not and do not work against defenses as good as the one based in Fargo. If the Bison force VanGorder to throw, that opens the possibility for the Bison to get interceptions. Linebacker Jabril Cox has four interceptions already this year, and three other members of the Bison secondary have two. VanGorder has thrown seven interceptions this year. 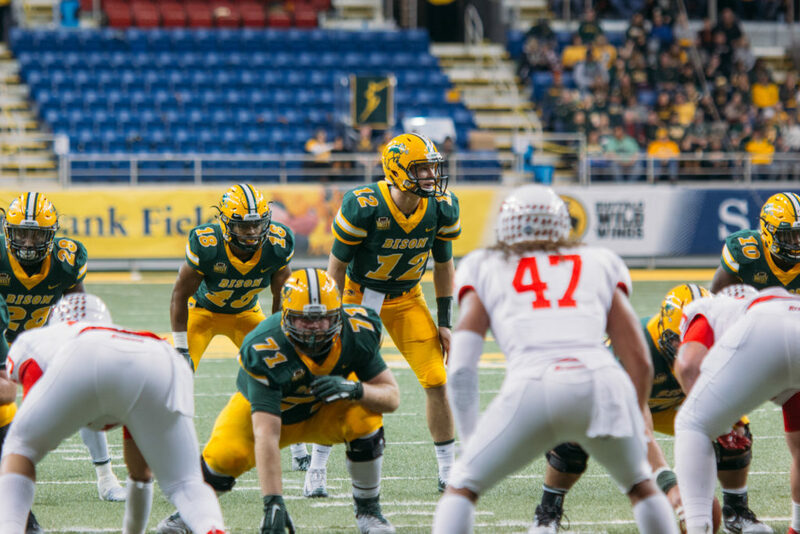 Kickoff at the Fargodome for the 44th Harvest Bowl is set for 2:30 p.m. Saturday. Next Next post: Why Come to College?